Join author Laura Deutsch for a week of writing and traveling in Italy’s jewel, Tuscany. “We’ll be based in the beautiful, medieval town of Arezzo, home to exquisite Renaissance frescoes and other art treasures. Exploring the softly rolling countryside with vineyards, olive groves, and deep green cypress trees, we’ll visit charming nearby cities and towns. Arezzo’s famous antique fair will take place the weekend after our retreat and you’re welcome to extend your stay if you’d like to attend. Find your own rhythm and become part of Arezzo’s daily life. Stroll down the Corso Italia, where the locals take their evening passeggiata. Window shop, people watch, stop in the handmade pasta market, relax at a sidewalk café with an espresso or glass of wine. The pace is slow, the people warm and friendly. Life is sweet, la dolce vita. 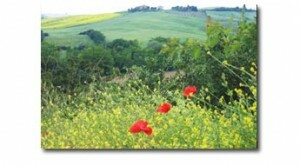 Most days, we’ll have a morning class in Arezzo and an afternoon excursion. Our visits to local markets, medieval towns, and Renaissance art will provide great material for writers of all genres and offer a rare opportunity for those who would like to write memoir, travel, food, art or history. We’re staying in lovely studio apartments, each with private bath and kitchen, owned by a delightful Italian family. The workshop includes classes, side trips, and time to write. This will be a memorable experience. With bountiful markets and a kitchen in your room, it’s possible to eat very well at a reasonable price. * Writing classes: Most classes in Arezzo; one writing session in Orvieto. * Tour of Arezzo, including the famed Piero della Francesca frescoes. * Excursions to Orvieto, in nearby Umbria, with its magnificent Duomo, the Luca Signorelli Chapel, and Etruscan caves. Cortona, of “Under the Tuscan Sun” fame. This delightful hill town offers shops, lovely churches, two fine museums, and gorgeous views, including Lake Trasimeno. Poppi, where we’ll visit the castle and take in the glorious countryside. Arezzo is in the heart of Tuscany and Umbria, 40 – 75 minutes from Florence (depending on which train you take) and 2 – 2.5 hours from Rome. You’ll have a day at leisure, when you may visit Florence (40 minutes on the fast train) or Siena (1 hour by bus). If you’d like to extend your trip, we have reserved spaced at our hotel for the Antique Fair. $3995, based on double occupancy. A limited number of private rooms are available. Some singles available ($600 single supplement). Rates for trip extension for antiques fair, Oct 1 and 2, upon request. Payment is due now, as she must send deposits to Italy. Cost does not include airfare or ground transportation to Arezzo. * Price based on the dollar/euro rate may be adjusted to reflect exchange rate at time of trip. For more details and to book visit LauraDeutsch.com.